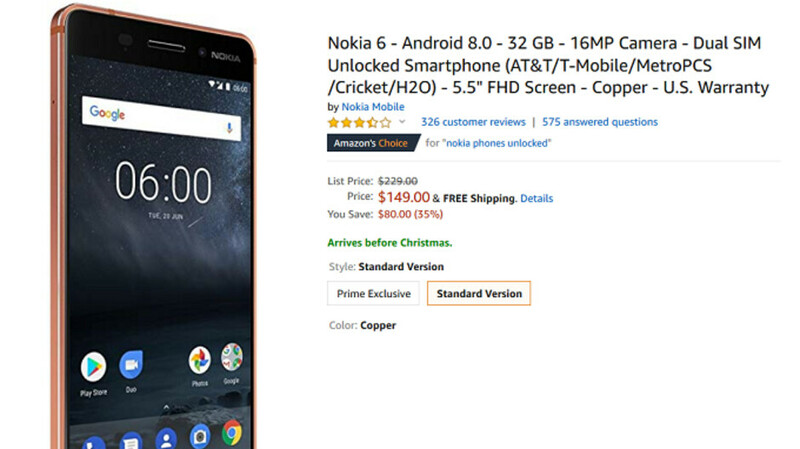 If you're still looking for a great deal on a smartphone to give as a holiday gift, or for yourself, Amazon is now selling the Nokia 6 (2017) for $149 (via Android Police). That is an $80 or 35% discount off of the usual price of the handset. If you're considering buying the phone to put under the Christmas Tree, Amazon promises that orders placed now will arrive before Christmas, and shipping is free. This is an unlocked model and works on GSM carriers like AT&T and T-Mobile. If you're unfamiliar with the phone, the Nokia 6 (2017) is equipped with a 5.5-inch LCD display carrying a resolution of 1080 x 1920 (FHD). Driving the handset is the Snapdragon 430 chipset. The handset features 3GB of RAM and 32GB of expandable storage. A 16MP camera adorns the back of the device, and there is an 8MP selfie snapper in front. Keeping the lights on is a 3000mAh battery. The Nokia 6 (2017) has been updated to Android 8.1 Oreo. Amazon is offering the Nokia 6 (2017) at this price for the copper model only. We should point out that the phone comes with a U.S warranty and offers dual-SIM capabilities. Since we're not sure how long this deal will be available, we would suggest that you do not procrastinate if interested in buying this phone. I agree although I don't think it matters too much since it's pretty much a foodstamp phone at this point. There are many reviews on the internet speaking positively about the dual speakers on the Nokia 6, ranging from good to better than good. With great build quality and decent camera (among other things) this phone has going for it, this is one good “food stamp phone”. Get off your high horse man. I was just responding to something someone else said. You don't have to comment on everything I say. Providing factual statements to your conjecture isn’t me being on a high horse. You’re just triggered because it’s me that’s proving you wrong. Good phone, but I would have preferred a better processor than the 430. The camera is good and the build quality is fantastic. This was a great selling phonne for HMD, and it was the start of them building the Nokia name back up. They still have a ways to go, but they have definitely done a great job so far, and they've done good by the Nokia name. I think it's a hard buy. For $50, you can get the Moto G6 and it has far better specs than the Nokia 6. Just my opinion. The Nokia 6 has much better software support and build quality, so it’s not a hard buy at all. Those are facts. Better build quality is subjective and software support isn't much better considering how slow the rollout for Pie is. Nokia branded smartphones having better build quality isn’t subjective, it’s a fact. Their software support is much better, considering they’ve got more smartphones on Pie than Motorola does. Also, the Moto G6 doesn’t cost $50, as you erroneously put in your comment #4, and it only has a better SoC than the Nokia 6, but not by much, considering it’s still in the SD4xx family. I think there are better options for $150, than a phone with sd430. I agree. Some people just don't want to admit that for some odd reason. While the SoC is a let down, considering the build quality and software support HMD provides its Nokia branded smartphones, one would be hard pressed to find a better alternative at the $150 mark when taking everything into account. Some people that always speak negatively about Nokia branded smartphones just don’t want to admit they for some odd reason.